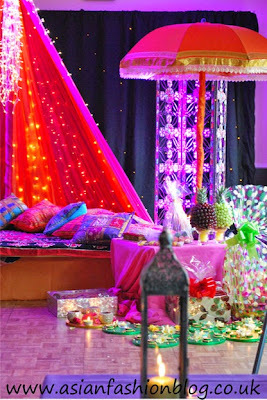 The first event of this close family wedding was the bride's mehndi. We were from the groom's side and travelled from Manchester to Nottingham for the event. For this event, I decided to wear a lengha and had the perfect outfit stored away in my wardrobe waiting for just the right occasion! 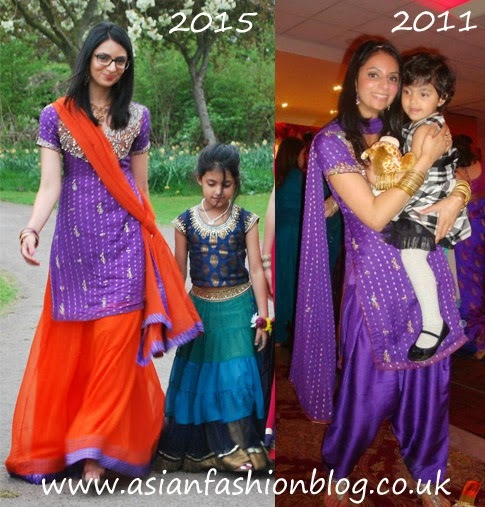 It was an outfit which was originally a shalwar with a short kameez, all in purple. To re-wear it I'd had a new chiffon lengha and dupatta made to match in very bright orange shade! That's my niece with me in both photos, her lengha is from Rajas and Ranis; we've bought quite a few outfits for her from Rajas and Ranis, check out my review of their online shopping experience here. I didn't have my hair done, but I had my make-up done at the Laura Mercier counter in Harvey Nichols Manchester. I accessorised with a real gold earring and necklace set which I've had for years (a gift from parents for my 21st birthday! ), a bracelet set from Bees London, and a fresh flower bracelet made by my aunty just for this occasion! The night before the event, we booked mehndi artist Sabah Ismail to do our mehndi - she's fab and I would highly recommend her! In the pic above the colour hadn't fully developed by that point, and by the time the main wedding event came around it was much darker. Overall I felt like it was a good choice of outfit for a mehndi, although my heels got caught in the lengha a few times, it was generally easy to move around in and more importantly - to dance in!